Zhu Qinfeng, a PhD student in the Department of Media and Communication, has been awarded prestigious Fellowship under the Fulbright-RGC Hong Kong Research Scholar Award for 2018-19. She will go to the University of Michigan for ten months to continue her research on examining the effect of social media on the phenomenon of polarisation through selective avoidance behaviours like “unfriending” and “unfollowing”. 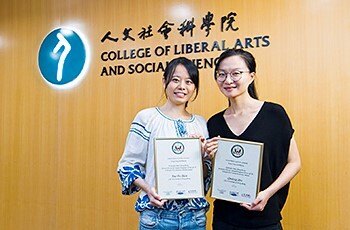 Zhu Qinfeng expressed her gratitude to the Department of Media and Communication for providing a very generous and supportive environment that had enabled her to grow as a scholar. “As a young scholar, I am both honoured and thrilled to receive the Fulbright Award in recognition of my academic achievements and as an opportunity for me to pursue my research in the right place at the right time,” she said. She especially thanks her Doctoral advisor Dr Marko Skoric for his tremendous support and valuable guidance.